Dib, Kamal, Ian Donaldson and Brittany Turcotte. 2008. 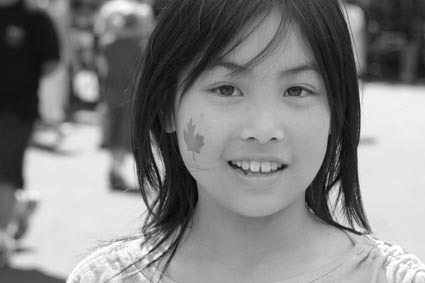 Integration and Identity in Canada: The Importance of Multicultural Common Spaces. Canadian Ethnic Studies, 40, no. 1: 161-187. Corbella, Licia, 2006a. Dangerous Disconnect, Calgary Sun, 11 June. Corbella, Licia, 2006b. Sociology Prof Warns Multiculturalism Creates ‘Nations within Nation’, Calgary Sun, 19 June. Hartmann, Douglas and Joseph Gerteis. 2005. Dealing with Diversity: Mapping Multiculturalism in Sociological Terms. Sociological Theory 23, no. 2: 218-240. Huntington, Samuel, 1993. The Clash of Civilizations? Foreign Affairs, 72, no. 3: 22-49. Huntington, Samuel, 1996. The Clash of Civilizations and the Remaking of World Order. New York: Simon and Schuster. Jedwab, Jack. 2005. Neither Finding nor Losing Our Way: The Debate over Canadian Multiculturalism. Canadian Diversity 4 no.1 Winter: 95-102. Kirkham, Della, 1998. The Reform Party of Canada: Discourse on Race, Ethnicity and Equality. In Racism & Social Inequality in Canada, ed. V. Satzewich, 243-267. Toronto: Thompson Educational Publishing. Wong, Lloyd. 2008. Multiculturalism and Ethnic Pluralism in Sociology: An Analysis of the Fragmentation Discourse. Canadian Ethnic Studies, 40, no. 1: 11-32. In spite of the lack of evidence of major fragmentation in Canada some of the critics of multiculturalism in Canada still want to believe fragmentation exists so this debate is reduced to the level of debating what is meant by “fragmentation”. Other critics of multiculturalism, while acknowledging that there is no current evidence of fragmentation, posit the argument that in the future multiculturalism still allows for the potential for fragmentation. This position can also easily be debunked. Those who argue that fragmentation is inevitable basically have a simplistic and naïve view that is one-dimensional. Their position is a dichotomous and binary one where one assumes that you either have 1) assimilation and thus unity and social cohesion; or 2) multiculturalism and thus fragmentation and clash of cultures. It is easy to move beyond this problematic one-dimensional framework. There are several ways to conceptualize a framework that provides alternative visions of multiculturalism in Canada. For example, there have been “visions of difference” developed in the sociological literature that run along two dimensions. One dimension is where there is a cultural basis for social cohesion involving both substantive moral bonds and procedural norms while another dimension involves ones’ basis for association, either at the individual level or the level of mediating groups. (Hartmann and Gerteis 2005, 222-224). As Figure 1 illustrates there are two other models or visions of multiculturalism aside from the fragmentation position or model. These are cosmopolitanism and interactive pluralism, however, space here does not permit for an elaboration of both so only the latter will be discussed.